By the assembly of any mechanism should be initiated after careful preparation. It is necessary to prepare not only the details, but also tools, a place, lubricant. 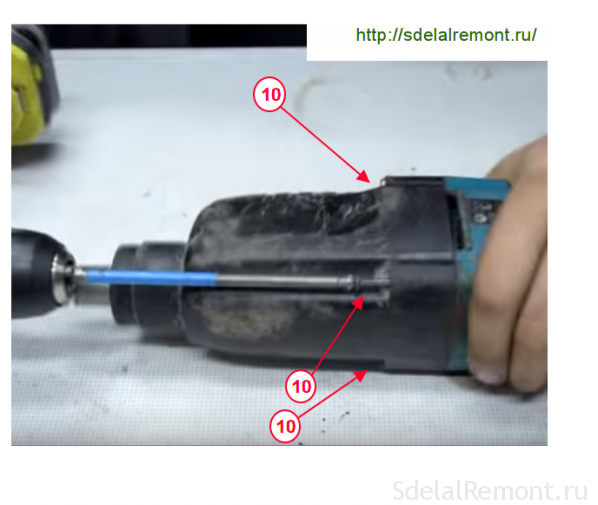 Of the tools can not do without a pair of pliers, screwdriver, hammer, brushes for applying lubricant. A kakova scheme already build punch Makita 2450 and 2470? 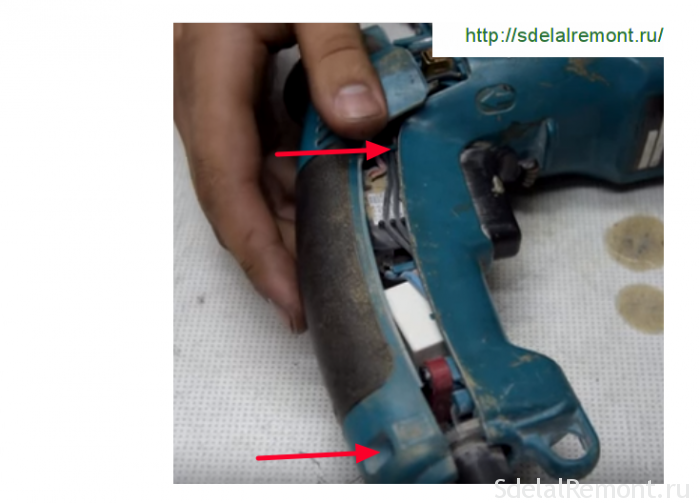 Makita perforator assembly with his hands can be performed only when the subject of the appended instructions. 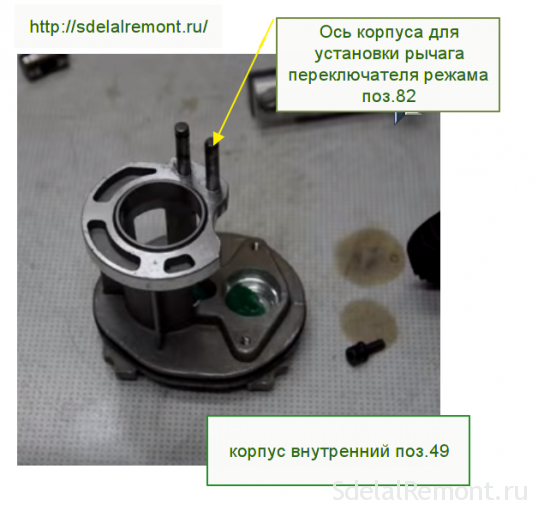 The object of the assembly process is the replacement of defective parts published on fit and ensure interchangeability and tool efficiency. 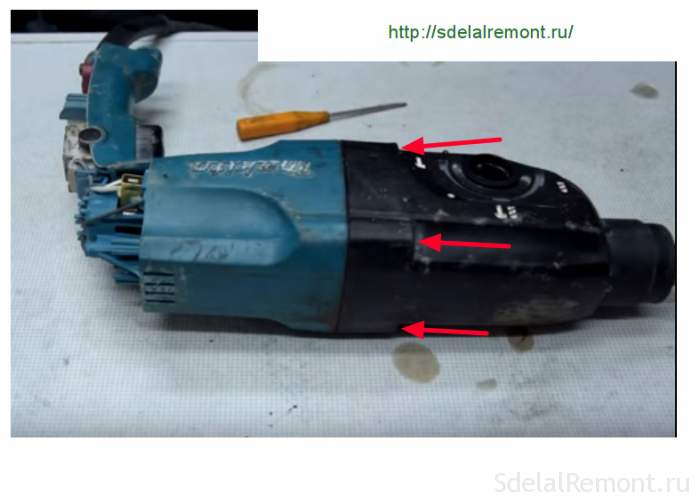 But how to collect punch Makita hammer mechanism? The firing mechanism is assembled from two nodes: stem shaft with spur pinion and an intermediate shaft with the bearing rolling elements. BUT). 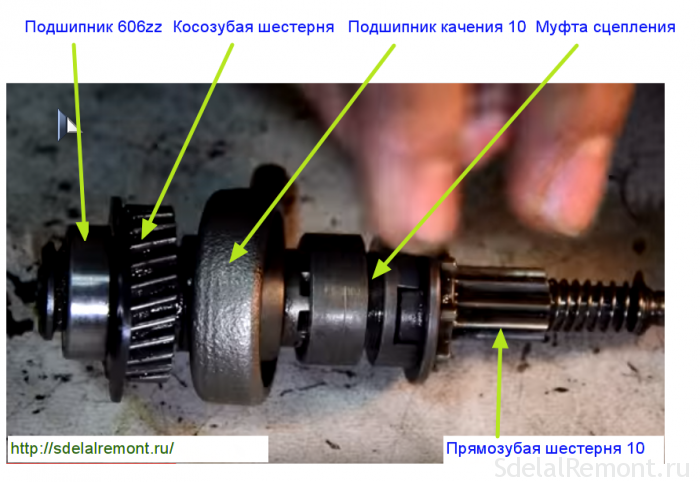 On the trunk poz.21 spur gear is worn and pressed poz.19 compression spring poz.18. For fixing spring presses against a washer 30 poz.17 and fixed a lock ring 28 pos.16. B). it is necessary to wear a ring for assembly pin 9 poz.25 the shaft hammer, pull the rubber ring at 26, pin metal ring poz.27. Now we go to the opposite side of the trunk poz.21. On the other hand the inner surface of the barrel should be lubricated with grease and insert into the assembled drummer poz.24. 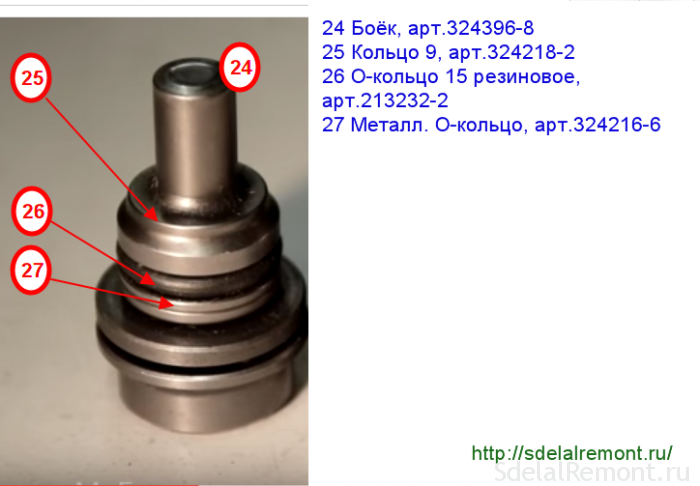 To assemble the intermediate shaft must wear poz.41 rolling bearing on a shaft poz.40 teeth to the shaft splines, Slots on the shaft wear sleeve poz.39. On the opposite side of the shaft fits spur gear 26 poz.42., flat washer 8 poz.45, 608zz poz.46 bearing and a retaining ring 8 poz.47. The intermediate shaft is assembled. 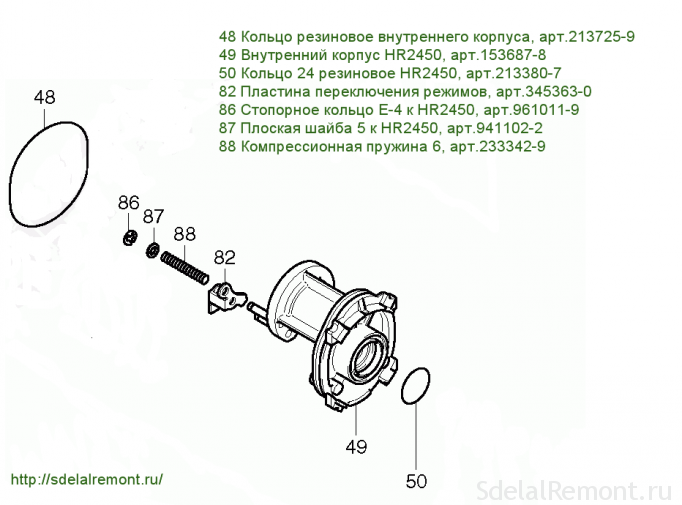 Installation of the gear unit is made on the inner housing poz.49. by the way, there are cases, when popping out of the axis of the inner aluminum shell. The chassis both axes are pressed. 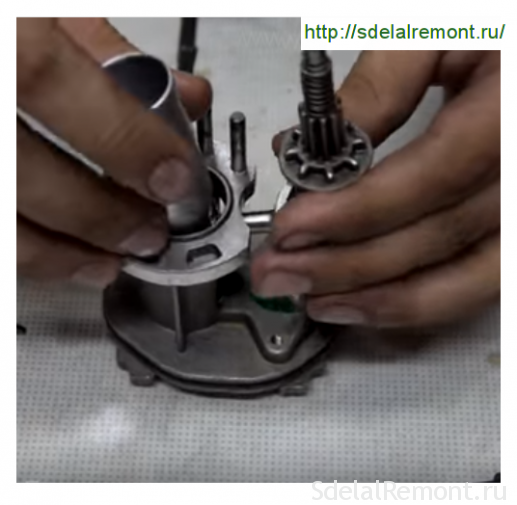 The assembled body is inserted poz.49 countershaft, Rolling bearing which lever, should get into the cylinder bore of the hinge. 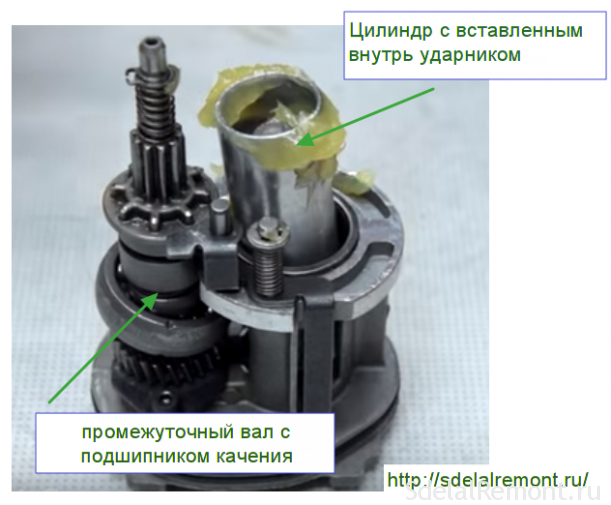 In this rolling bearing poz.41 intermediate shaft lever must get into the cylinder hinge poz.32, a lower bearing of the intermediate shaft into the slot in the housing. This procedure usually is performed by rocking the structure to complete contact pieces in said space. Mode switch is designed to transfer poz.39 clutch in different positions and transmit the translational motion of the shaft impactor through the rolling bearing to the cylinder poz.41 poz.32. 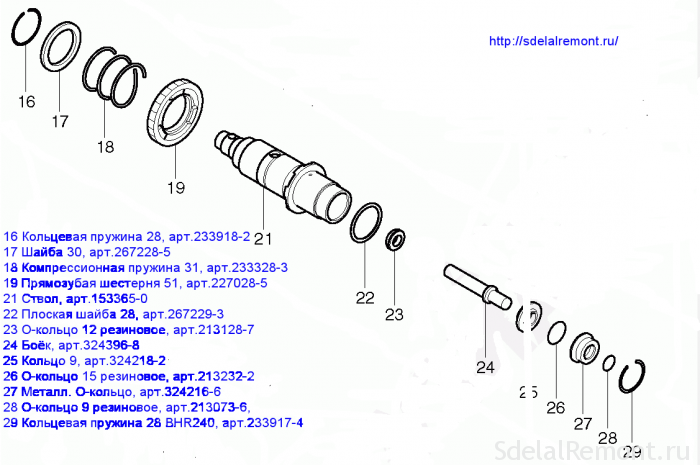 On the inner body axis must wear the mode selector lever poz.82, top poddavlivat spring poz.88, crush flat washer poz.87. Install the snap ring poz.86. and secure. Retaining ring it is necessary to carefully fix. Turning countershaft, it is necessary to carefully check the proper operation and free play in the cylinder housing. This must be done now!, that it became clear at the end of the assembly, that it is assembled incorrectly. 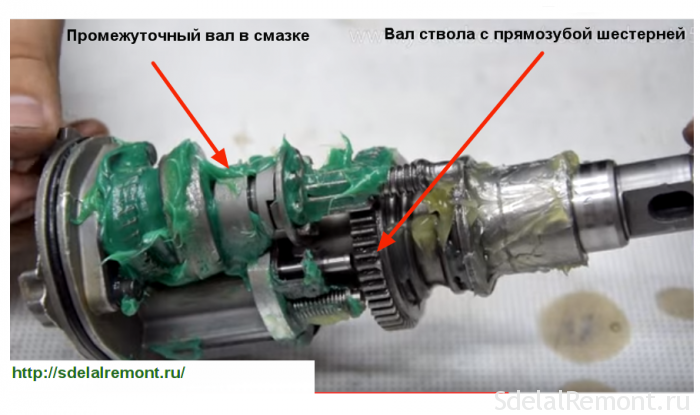 First you have to grease the inside of the cylinder poz.32 and insert the striker poz.30. It left into the inner housing poz.49 put oiled barrel assembly into place poz.21, putting it on a greased cylinder poz.32. As lubricants recommended special grease, designed for rock drill Makita. 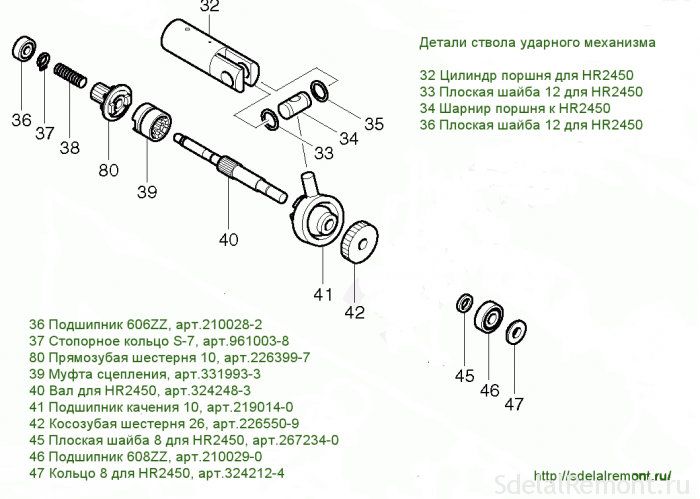 Lubricants produced several species: so P-08361 и Spot 183477-5 SDS-PLUS. Makita Grease 183477-5 SDS-PLUS is recommended for gear. For shank drills used Makita brand lubricant 196804-7. Lubricants vary in color, but have exactly the same characteristics. And some grease used in punch Makita 2450 and 2470? And here in front of us assembled mechanical unit. 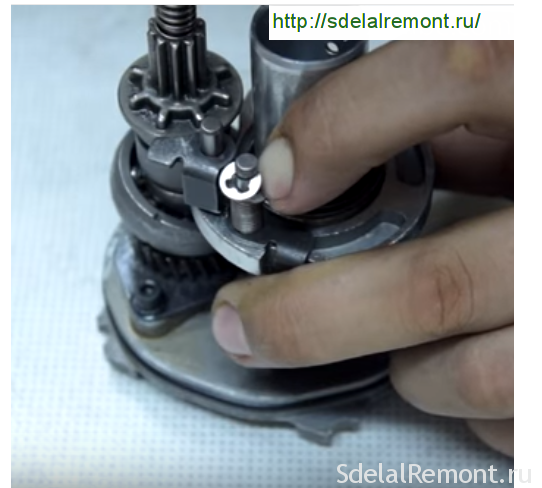 Test it, rotating the intermediate shaft and controlling the movement of the piston in the striking mechanism. Everything! Now smazhem all parts of the mechanical block recommended lubricant. 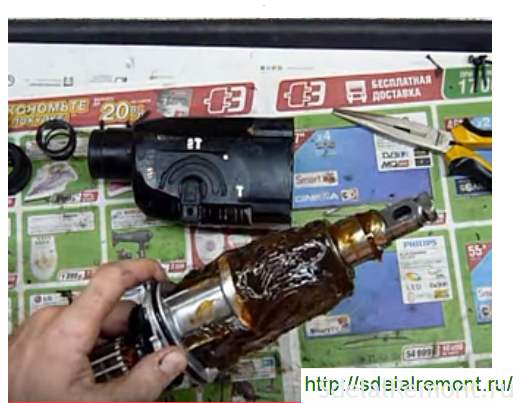 Here is an example of proper lubrication on the rotating surface. And here's another example of the generous lubrication of the mechanical block. So, too, are allowed to apply lubricant. Porridge oil will not spoil! 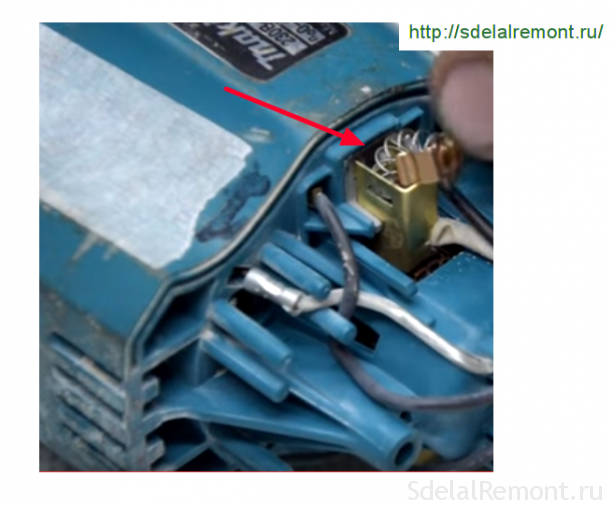 Lubricated mechanical unit it is necessary to close the plastic housing pos.14 black. Putting the body on top of the unit, press down until it locks housing assembly therein. Backwardness insert four bolts pos.10 into the body and tighten. Now came the turn of accession to the mechanical part of the motor rotor. 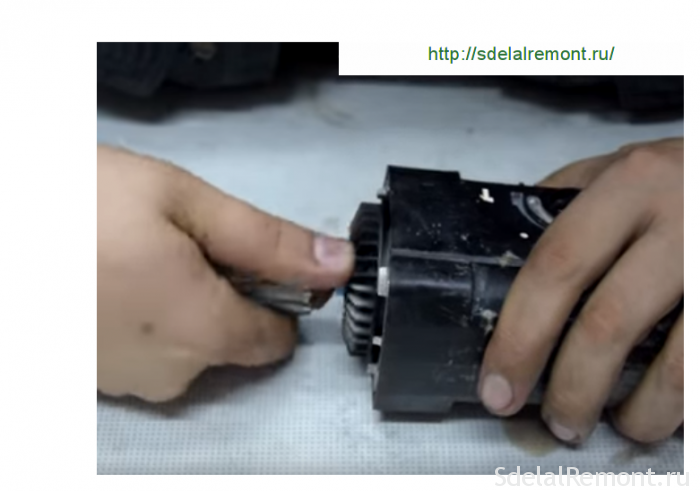 The helical gear rotor tightly inserted into the mechanical block body and pressed. It remains to insert four self-tapping screws m4 × 60 poz.57. and screw them into the body for electrical installation. Remove dirt from the brush holder slots and set in place the brush, fixing their snaps. Now is the time to test the functionality of the gun. 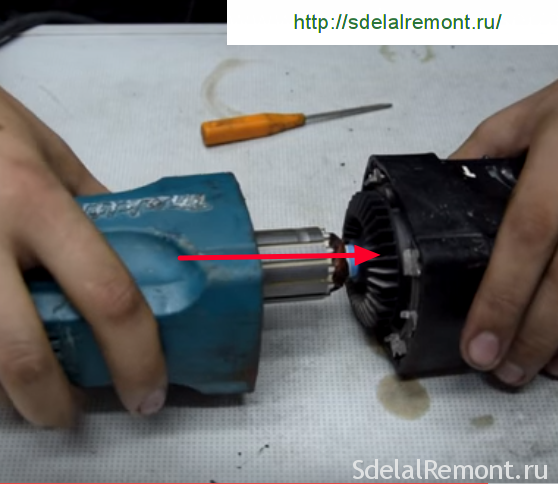 Connect the plug into an outlet perforator, briefly turn the punch in the "drilling" mode. Convinced of the instrument performance, turn it off. Put the mode switch to "blow". The tool does not insert. Check the punch performance in this position. At the same time you checked and the operating mode selector. It remains to check stacking the Inverter speed button, verify the reliability of contact connections, and you can begin to install the cap bill. The lid is secured by three self-tapping screws M × 4 different lengths. Connect to punch 220Β network and check for all modes. Perforator Makita 2450 or 2470 assembled and working properly!